In his wildly entertaining debut novel, Hank Green—cocreator of Crash Course, Vlogbrothers, and SciShow—spins a sweeping, cinematic tale about a young woman who becomes an overnight celebrity before realizing she's part of something bigger, and stranger, than anyone could have possibly imagined. Roaming through New York City at three a.m., twenty-three-year-old April May stumbles across a giant sculpture. Delighted by its appearance and craftsmanship—like a ten-foot-tall Transformer wearing a suit of samurai armor—April and her best friend, Andy, make a video with it, which Andy uploads to YouTube. The next day, April wakes up to a viral video and a new life. News quickly spreads that there are Carls in dozens of cities around the world—from Beijing to Buenos Aires—and April, as their first documentarian, finds herself at the center of an intense international media spotlight. Seizing the opportunity to make her mark on the world, April now has to deal with the consequences her new particular brand of fame has on her relationships, her safety, and her own identity. And all eyes are on April to figure out not just what the Carls are, but what they want from us. Compulsively entertaining and powerfully relevant, An Absolutely Remarkable Thing grapples with big themes, including how the social internet is changing fame, rhetoric, and radicalization; how our culture deals with fear and uncertainty; and how vilification and adoration spring for the same dehumanization that follows a life in the public eye. The beginning of an exciting fiction career, An Absolutely Remarkable Thing is a bold and insightful novel of now. 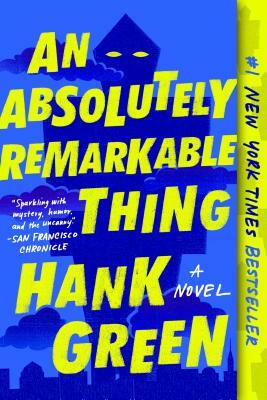 Hank Green is the #1 New York Times bestselling author of An Absolutely Remarkable Thing. He's also the CEO of Complexly, a production company that creates educational content, including Crash Course and SciShow, prompting The Washington Post to name him "one of America's most popular science teachers." Complexly's videos have been viewed more than two billion times on YouTube. Green cofounded a number of other small businesses, including DFTBA.com, which helps online creators make money by selling cool stuff to their communities; and VidCon, the world's largest conference for the online video community. In 2017, VidCon drew more than forty thousand attendees across three events in Anaheim, Amsterdam, and Australia. Hank and his brother, John, also started the Project for Awesome, which last year raised more than two million dollars for charities, including Save the Children and Partners in Health. Hank lives in Montana with his wife, son, and cat.